Today’s post combines two of my favorite things: DIY and a recipe. For a cocktail. Happy weekend! Anyone on the East Coast will tell you the same thing–it’s been a LOOOOONG winter. And then, suddenly, the sun will come out and it’s 65 and you put on your sundress and waltz through the streets thinking “It’s SPRING!”–only to wake up the next morning to a weather report that reads 45 degrees again. Sigh. So I was determined to create a little corner of green and growing things in my Manhattan pad, and I had just the sunny windowsill to do it. Last Saturday, I went a little nuts thoughtfully acquired some lovely herb plantings from one of my favorite spots in New York—the Union Square Green Market. On my windowsill they went, awaiting an escape from their little plastic containers. All eleven of them. I needed pots. LOTS of pots. In checking out the outdoor selection of my favorite online design stores, I fell in love with these little beauties from West Elm. However, I quickly realized that buying as many as I needed was going to blow my window garden budget WAY up. Then they went on sale (HOORAY!) . . . and five seconds later, they were gone at every store in the area (BOO) . . . and my little plants needed some room to breathe. When I googled some more, I discovered that plain old terra cotta pots are, in fact, dirt cheap (no pun intended). 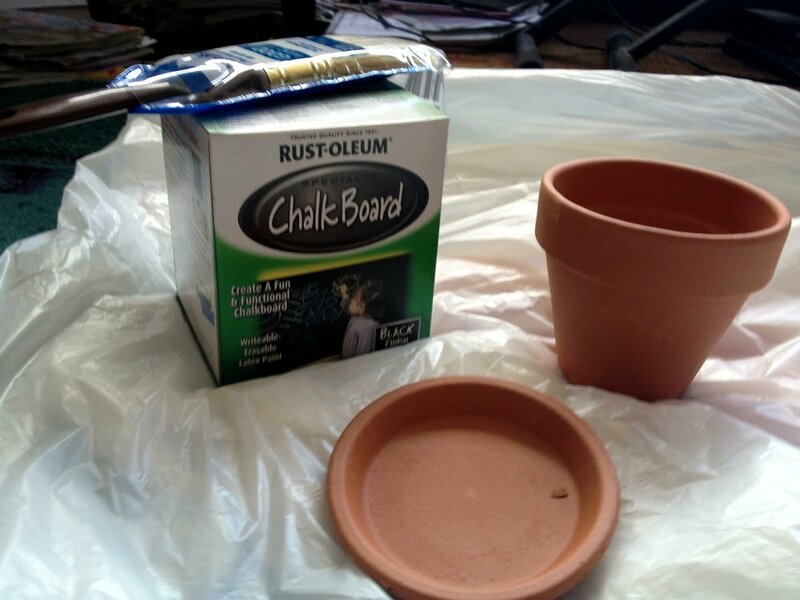 So Wednesday, I hauled home about 25 pounds of various-sized terra cotta pots, saucers, a brush, and a little container of chalkboard paint from Home Depot and got to work on recreating the look of the West Elm pots. Now, if you’re a newbie painter/DIY-er, this is an AWESOME project. Chalkboard paint goes on terra cotta like soft butter on hot bread. (MMMM… hot bread. I smell a recipe post.) It also covers beautifully and dries quickly. Cover the pots completely on the outside (no need to do the bottom), and about an inch into the inside rim of the pot so the color is consistent when you fill them. The paint will set very quickly, but let them dry for at least 4 hours before you move on. To pot your herbs, pair up your pot with its saucer, put a few inches of potting soil into the bottom of the pot and give it a sprinkle of water. Then carefully remove your plant from its old container (if the container is one of those flexible plastic ones, it helps to roll it between your hands gently to loosen it). Now break up any matted roots with a pencil or chopstick and spread them out a bit. Place in the pot on top of your potting soil–make sure the base of the plant is a little below the lip of the pot–and fill in more soil around the roots and base of the plant. When you’re finished, give that puppy a serious watering. Though I mostly bought tiny herbs, I went for a giant, well-developed mint plant at the market. Why? ’Cause I LOVE cocktails with fresh mint. Like the one below. Make sure you research care of your various herbs–I have some that love water and want it often (basil, dill) and some that like dry conditions (rosemary, sage, oregano, lemon thyme). Some need a lot of sun and others can tolerate shady spots. I am lucky to have a nice mix of sun and shade, so I’m hoping they’ll all play together nicely. If you have mostly shade, don’t despair. Some plants really crave shade. Most herbs need frequent trimming to stay healthy (great excuse to find recipes!). I’m planning on some very flavorful meals this summer. I also plan on saving some money, because when have I EVER used that whole bunch of cilantro on one recipe of guacamole? And don’t get me started on $4.99 for a tiny plastic packet of fresh thyme. Much easier to pinch off a couple of leaves when I need ‘em. Ladies and gentleman, I give you: The Gin-Gin Mule. I was introduced to this little beauty on our Les Mis tour stop in Salt Lake City. It’s simple, tart, refreshing, perfect for warm weather. It begs to be paired with spicy Mexican or a giant fresh salad. And maybe a sundress and straw hat. Cut your limes into quarters and squeeze those babies into the bottom of your highball glass. I like mine super lime-y, so I use at least half a lime per glass, and then throw the squeezed remnants in the bottom of the glass. Tear up a few sprigs of mint and add to the glass. Then add a shot (or two!) of gin and muddle together (cocktail newbies, this means crunch/press all that flavorful stuff together with a muddler tool or the back of a spoon). Add ice, top off with ginger beer. If you like it pretty, garnish with extra lime and a spring of mint, and if you’re feeling SUPER fancy, a chunk of candied ginger. YUM. *A “mule” is the old-fashioned name for an entire category of mixed drinks made with ginger beer. If gin is not your thing, you can do a “Moscow Mule” with vodka. Or bourbon. Endless variations! And if you don’t drink, drop the alcohol completely and enjoy some lime-y, minty ginger beer.